Email list is a central part of your email marketing campaign. This list is the main connection between your campaign and its success. And if you are familiar with email marketing you must know that these email lists can be bought, rented or even built by yourself if you have the proper channel to do that. This method has been used in the email marketing industry since its birth. It is simplest and easiest of the options available. There are many vendors online offering lists for different clientele, different locations or different purposes. You will find all kinds of lists for example list of corporate personals in New York or a list of emails of clients based in Ohio. It is as simple as that but buying a list requires some effort on your part as well. You need to make sure that the list you are buying meets your requirements. Most people look for the value of money but forget that in email marketing quality is truly the most significant aspect. You can buy a list with hundreds of thousands of email addresses but if they contain any bogus or bad emails, your bounce rate can jump up and your email may even get blocked. It is imperative to buy from a trusted source only. Many scam sellers have popped up on the internet that offers a big amount of emails for very low prices. These lists contain mostly generic and stale email addresses that can have detrimental consequences. Buying a list is just one part of the job, as a marketer you need to continuously improve your marketing strategies. 42% of B2B companies reported that email is their most effective lead generator for acquiring new clients. Here is an article that shows how B2B marketing emails can be improved. Renting is another viable option if you do not have a list of your own. This is often misunderstood and mistaken for buying an email list. However, renting a list is different from buying a list. It is widely used for marketing through emails and has a decent ROI rate. So the main difference between buying and renting a list is that you do not get the list in your hand. This brings down the cost a bit but since you do not get the email list, you must pay every time you need an email sent. Everything that we discussed about vendors selling email lists applies to renting a list as well. The list has to be reliable and relevant to your business goals. And the owner of the list needs to be verified. The risks with bad or stale email addresses should be mitigated in these lists as well. The owner just sends your email to the list, designing the email and making it better is still your job. This is all about offering something valuable in order to get someone’s attention. This is probably the most laborious option but the results make it worth the effort it requires. Here, you build your own list from scratch. This, of course, takes a lot of time and determination and is much more difficult than buying or renting a list. Getting people to subscribe can be a tedious task. People would generally resist giving their email addresses to someone. However, if there is something on offer that they like, they will indeed subscribe. 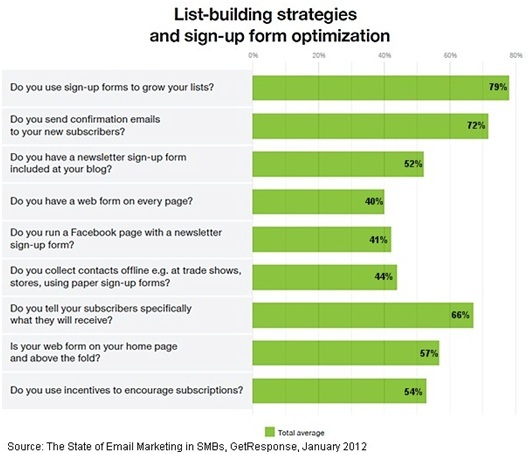 You can build your list by getting people to sign up for a newsletter. Here are 7 tips to get you started. There are many ways you can go wrong in trying to build your own list. It is important to research thoroughly before taking any step. Sean Donahoe talks about 5 simple methods to building a list in his video. These methods are free and have proven affectability. Now that you know what buying, renting or building a list is about, it is important to mention that there is no best option. It entirely depends on your requirements and your situation. If you need a list on urgent basis buying or renting would be a favorable option. If you only require a few email subscribers, then building your own list could be beneficial. 92% of online adults use email and 61% of these use it daily, according to Pew Research. This evidently shows the power of email. You cannot really go wrong with choosing email for marketing. However, how you do it determines your success. This entry was posted in Email Delivery, List Building. Bookmark the permalink.